Saturday 21st February 2015 – Mark’s 42nd Birthday! What is the answer to “The Ultimate question of Life, the Universe and Everything?”….42! Mark has been looking forward to turning this magical age for quite some time…..42 years in fact. 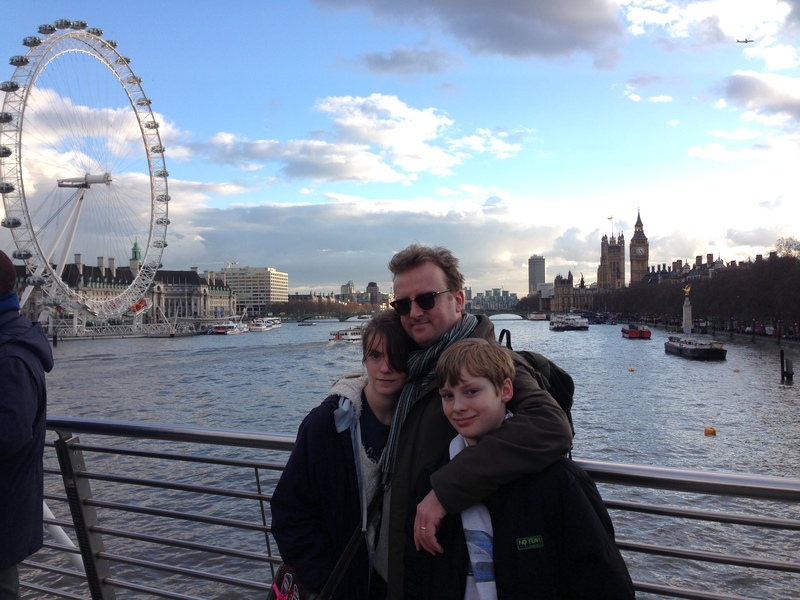 So for his birthday (being that it fell on a weekend) he wanted to go to London for the day. Now I know that he works in London, but doesn’t really see much of it because he’s in an office for most of the day, and then crammed into a train. So today we were tourists. In our house when it’s your birthday you get to choose what you’d like for breakfast, lunch and dinner. It’s a tradition, and doesn’t matter how old you are. So after a “Fry up” for breakfast, we headed to the train station. 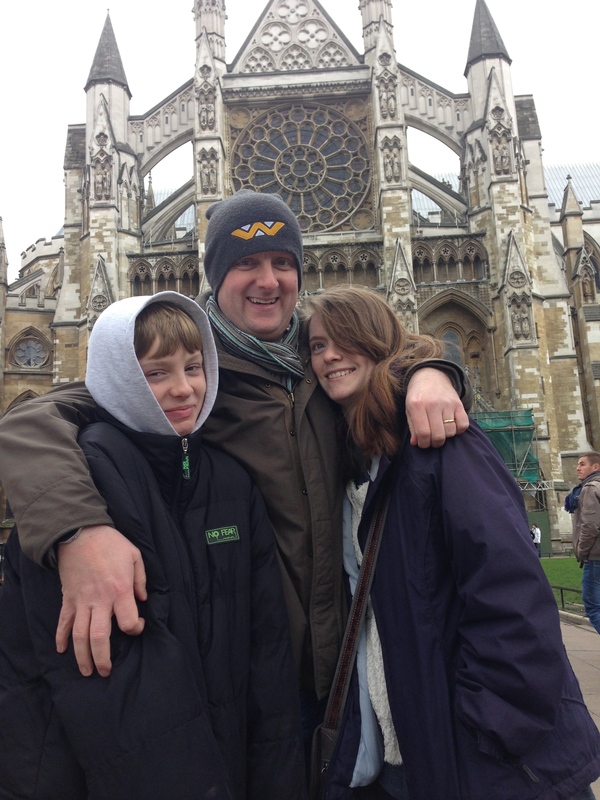 When we arrived up in our big capital city we headed for Westminster Abbey. None of us have every been here before, I don’t know why but there you go. You have to pay to get in, but we had 2 for 1 tickets so it didn’t work out that expensive. For some reason (we’re not sure why) you’re not allowed to take any photos or film anything. There was no service going on, just a lot of tourists wandering round listening to their little information phones. Can anyone answer this question for me? If you did try, then you were very sternly told not to. I would like to say that I didn’t get told off, or even try to take any photos…I was a good girl. Mark on the other hand took a sneaky photo of the “Oldest Door in Britain” which was made in the Anglo-Saxon times and built in about 1050. He didn’t get caught. Outside Westminster Abbey because you’re not allowed to take any inside!! There are lots of dead people in the church, and we were forever standing on tomb stones or memorial stones. Poor dead people must be fed up of tourists wandering over them, there they are trying to lie down for a bit of peace and quiet. After we left the Abbey we sat down outside for a little snack, and then wandered over one of London’s many bridges to our next destination. On one of London’s many bridges. The cross wind was rather brisk. Our next stop was The London Dungeons. This is now in it’s new home on the Southbank near the Aquarium and the Big Wheel thing (again I’ve never been on this). Mark has been to the Dungeons before, but in it’s old home in Tooley Street, but a long time ago. Now I like scary things, like horror films, but not scary things like roller coasters (see our Florida trip for more information on THAT!). It was really good inside the Dungeons, you were in groups and moved from room to room being told information about various killers and historical gore from various times. It was done very well. We were in for a good 2 hours and they had group participation whether you wanted to or not. It was great fun. At the very end of the tour, you get strapped into a chair and dropped the height of a house TWICE!! I was not sure about this, but was convinced that it would be ok by the rest of my loving family, but when I heard the screams from the previous group and I made my choice NOT to go on it. Apparently I would have hated it!! We had a little time to spare before our dinner reservations, so firstly we went to Forbidden Planet. It’s a geek store, and we’re all geeks in our own little way. Emily is into Japanese stuff, Mark is Sci-Fi mainly Star Wars (the original ones episode 4, 5 and 6), George is into Marvel and stuff, and I love various things, like The Big Bang Theory. The kids bought some things, and I treated Mark to a Star Wars T-Shirt and I bought myself one as well. 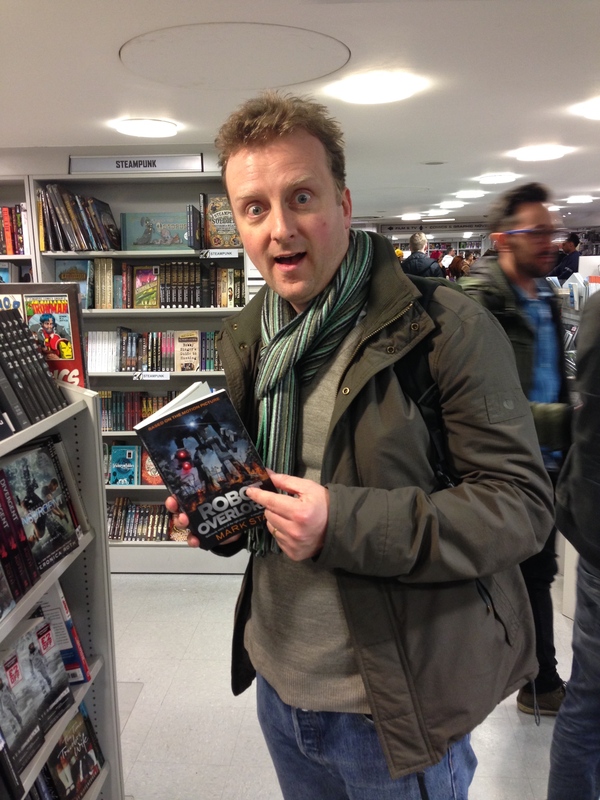 Mark saw his book on sale which was a little surreal. Oh no, it’s that author again!! Afterwards we went wandering through China Town. It’s beautiful at the moment as they’re celebrating their New Year and the town is decorated beautifully. If you get a chance, pop up to see it very soon as it’ll all be over in about a week. The year of the Goat started on 19th February, just incase you were wondering. They had some wonderful fruit and vegetable for sale. 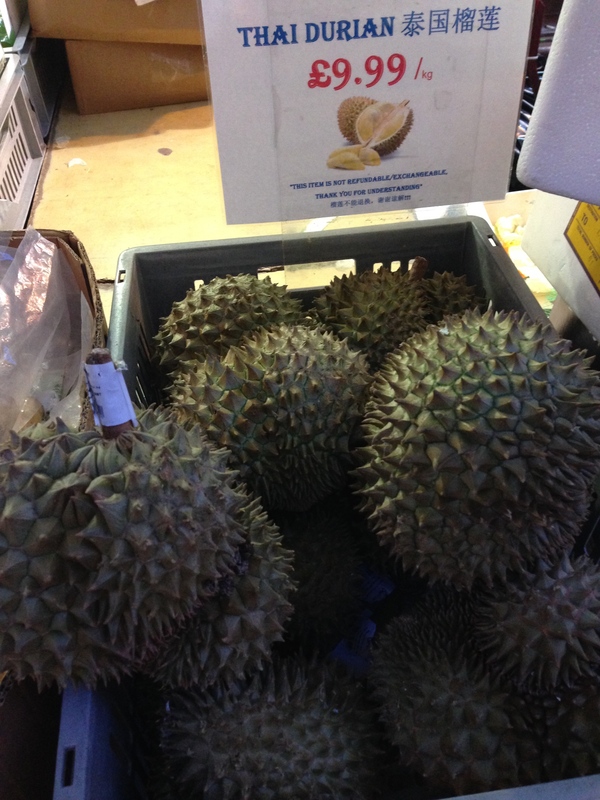 I wonder if I’ll be able to grown this spiky Thai Durian. Do you think I can grow this on my allotment? We had dinner at Ceviche, which is a little Peruvian restaurant. The food was amazing!! Go if you can, it’s well worth it. It’s fairly spicy, and all the dishes are for sharing, which is great for the kids as they can try all sorts of different foods. George liked the octopus, and Emily found that she now likes beetroot. The sea bass is out of this world!! You must try the cocktails as well, I had 2 Pasion de Ceviches which has ginger, apricot brandy, passion fruit and cinnamon in it. You could drink a lot of these if you weren’t careful because they don’t taste alcoholic. Once we’d finished we got the train back home and once back home it was time to sing Happy Birthday and have a bit of cake before we all went to bed exhausted. This entry was posted in Uncategorized and tagged Anglo Saxon, beetroot, Ceviche, China Town, claire's allotment, Douglas Adams, Forbidden Planet, Hitchhikers Guide to the Galaxy, london, London Dungeons, mark stay, Marvel, Octopus, Peruvian, Robot Overlords, Sea Bass, South bank, star wars, Thai Durian, The Big Bang Theory, Westminster Abbey. Bookmark the permalink. 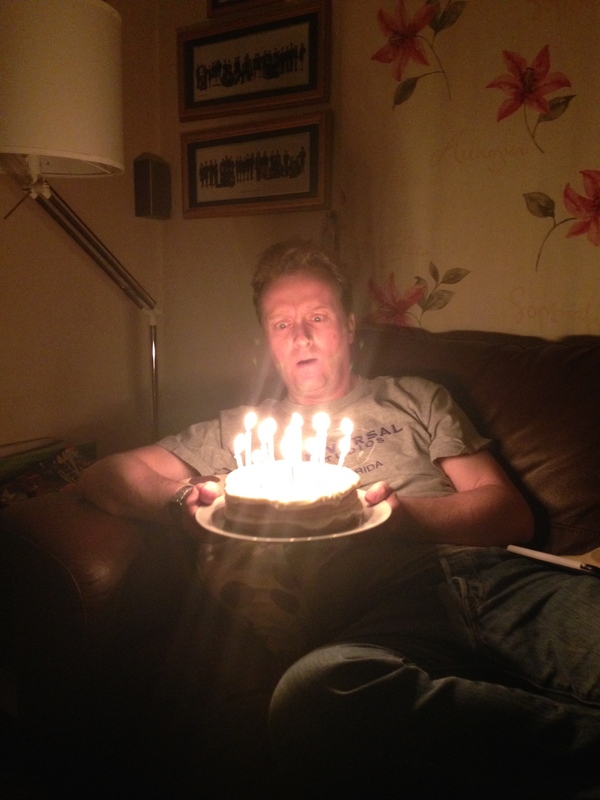 2 Responses to Saturday 21st February 2015 – Mark’s 42nd Birthday!